One of the largest and most underestimated social networks with around 200 million users (and around a $2 billion valuation) is Quora. Quora is kind of a mix between Reddit, LinkedIn, and the late Google Answers. Millions of questions are asked every day on every topic you can imagine (even very obscure ones you won't find on Medium and you'll only find on Reddit) and other members who are knowledgeable in those areas answer them. It's an excellent way to build your brand, drive traffic to your website or videos, and become an authority in your industry. You start your profile by ideally connecting your account to Facebook and Twitter, which helps you to find and connect with your existing friends and followers. You then create and optimize your profile including links to your other social media accounts, blogs, websites, products, or anything else you're looking to promote. You can start a free blog there as well if you want. I wouldn't recommend it over Medium, LinkedIn, or WordPress but it isn't bad and could help get you noticed if you acquire enough followers. Add topics that you're knowledgeable about and search for questions that are being asked. Answer those questions to the best of your ability with original content and include relevant links to your business websites as a resource for additional information. After a few weeks or months and you've built up a proven track record, members will be able to ask for you input directly on specific questions. You don't have to answer them but it's a good sign that you've established yourself in the Quora community. Your answers could generate anywhere from a dozen views to hundreds of thousands of views. Popular answers to popular questions do get sent out via email digests and updates to millions of members every week and this amplifies your content. 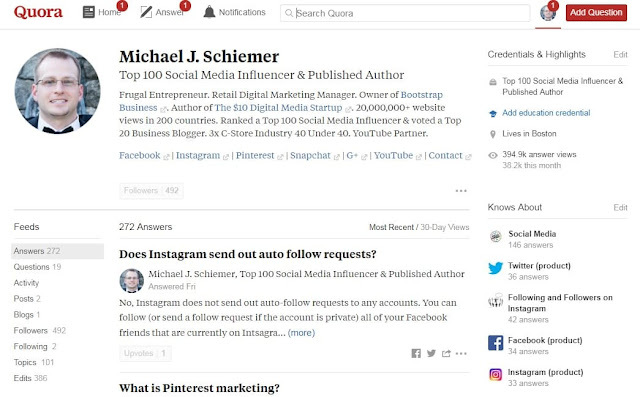 Some people can also share your posts to their own Quora profile or their social media pages like Facebook or Twitter to further amplify the reach. I even had a single answer to a question on Facebook vs. Snapchat that got over 250,000 views on its own. I now have over 1,000,000 views on my 600+ answers across 100+ topics. Posting content on Quora might not get the viral traffic potential that YouTube can generate but you can get close and the quality of conversions can usually be much higher. It's an excellent example of content marketing driving results. Now you can even share links directly to your profile or the new Spaces section. Eventually you'll build up enough followers that nearly all of your questions will . You can even rank in the Top 10 for topics that you've answered proficiently or be named to the year's Top Writers. And you can be proud that the extra website traffic you're enjoying is a direct result of providing value to other users and helping others in need. You can also ask questions from the large and active Quora community. For each question you ask, once per day you can directly ask up to 25 experts in that topic to answer it. Asking questions publicly (as opposed to anonymously) can also help to grow your follower count. Now Quora even has a Partner Program for high performing accounts like mine. You can earn money for each question that you answer depending on the impressions that the question generates and the associated Quora ads serving those question views. You just need to make sure that the question hasn't already been asked before. Some users have made thousands of dollars per month just asking questions on Quora! Like anything else, growing your following on Quora and reaping the business benefits is all about standing out and providing value. Yes you need to do both. You can provide the greatest and most insightful content ever, but if nobody knows you exist then it’s all for nothing. On the flip side, if you are a big name on social media but you provide few answers or they consist of a brief sentence answer then you’ll also struggle to generate a significant following. As with most online platforms, it comes down to a combination of content and marketing to become successful. But don't just take my word for it when it comes to Quora marketing. Countless digital marketing and social media influencers such as Gary Vaynerchuk, Neil Patel, Guy Kawasaki, James Altucher, Rand Fishkin, Larry Kim, and countless others have been utilizing Quora to further their reach, advertise their businesses, generate traffic, and make sales. If these rich and successful busy entrepreneurs can make time to contribute on Quora, what's your excuse? If you can't spend the time and effort building up a following on Quora, it may be more productive to look into their paid advertising options. Since Quora ads are not nearly as popular as Facebook Ads, AdWords, Twitter Ads, or Instagram Ads you can usually get a great deal on low-cost PPC and CPM. Quora Marketing is definitely worth at least taking a look at it. I hope you enjoyed this article about utilizing the Quora social forum network to help build your brand and become an industry authority. Interested in more articles about social selling and content marketing?